Only days after the 2016 Project Compassion Appeal was launched at St Mary’s Cathedral, Caritas Australia has again turned its attention to its core mission of supporting long-term development programs in impoverished communities around the world. This time, however, it did so in the context of Shrove Tuesday – a pancake-based lunch held before Ash Wednesday and in preparation for the Season of Lent. Held on 9 February at the Catholic Pastoral Centre of Our Lady of the Mission in Highgate, the event was facilitated by Caritas Diocesan Coordinator Sister Janet Palafox and saw Auxiliary Bishop Don Sproxton, along with directors and coordinators of various Church agencies, in attendance. Also present was University of Notre Dame PhD candidate and Advocacy Coordinator with Caritas Uganda, Davis Kawooya. As the keynote presentation for the event, Mr Kawooya held an informative talk on Caritas’ work in Northern Uganda. 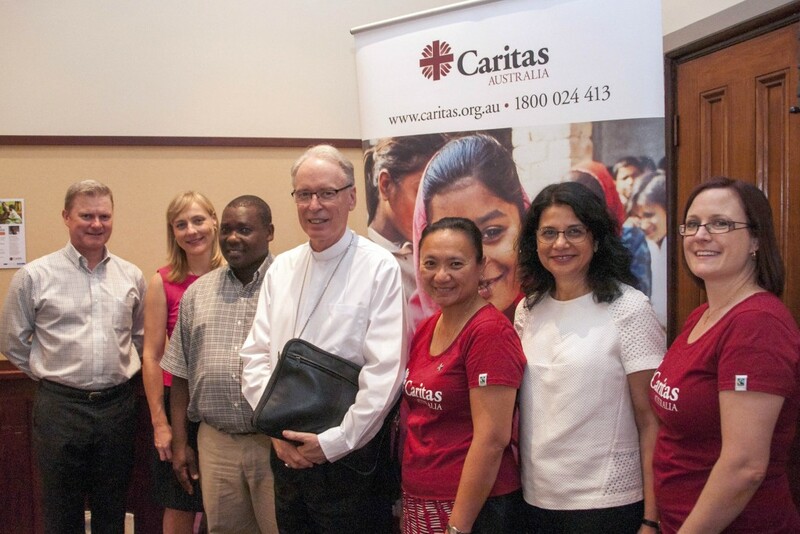 After an introductory address by Sr Palafox and an opening prayer by Bishop Sproxton, guests were invited to share an abundant lunch together provided for by the staff at Caritas Australia. A special cake was also shared for Bishop Sproxton’s birthday, which took place only days earlier. After lunch, the attention of guests was soon directed towards Mr Kawooya’s presentation on his experience working with communities in Uganda. Mr Kawooya worked for Caritas Uganda from 2005 to 2011 as an Advocacy Coordinator in charge of promoting peace and justice in war affected regions of Uganda. Among the activities which he participated in were the promotion of rule of law in communities and government institutions, the provision of humanitarian assistance, development of policy briefs, creation of dialogue among peace-seeking individuals and collaboration with other civil society organisations in promoting transitional justice. Mr Kawooya spoke of one Ugandan rebel group in particular, the Lord’s Resistance Army (LRA), which has been responsible for much of the conflict caused within Northern Uganda from 1988 until 2006. A short video was also shown featuring the victims of the conflict speaking Caritas’ involvement in the gradual rebuilding of their livelihoods. Caritas’ ability to offer humanitarian aid to people displaced by the violence of the LRA, Mr Kawooya explained, was crucial to their survival. 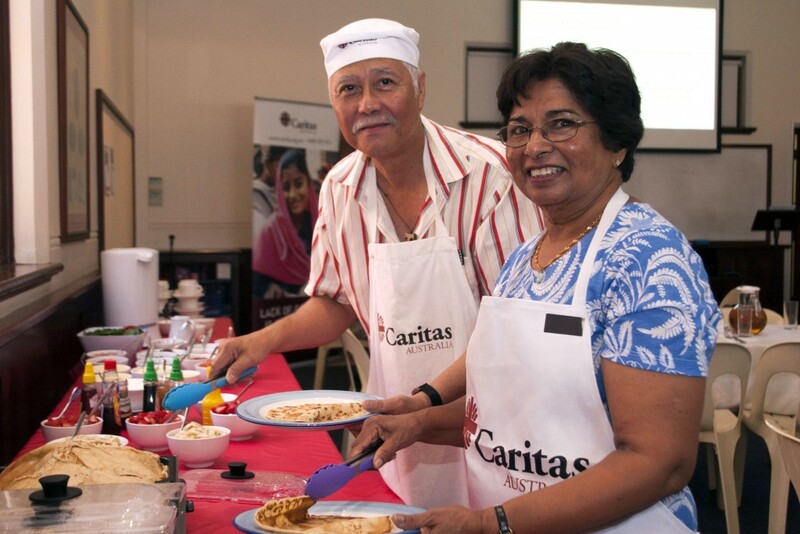 Cooks responsible for preparing the pancake lunch, Dominic Chew and Margaret Yesuratnam, help themselves to the fruits of their labour at the Caritas Shrove Tuesday pancake lunch. Photo: Marco Ceccarelli. “Much of the work done by Caritas during the conflict was to offer food to people internally displaced people, secure peaceful environments suitable to all, facilitate the return of children abducted to fight as ‘boy soldiers,’ and improve financial services for agricultural and other entrepreneurs,” Mr Kawooya explained. Following Mr Kawooya’s insightful talk, those present were invited to donate to the Caritas 2016 Project Compassion Appeal. Caritas Australia supports development programs in communities within Africa, Asia, East Timor, Latin America, Indigenous Australia and the Pacific — helping oppressed people to rediscover their dignity by taking greater control over their lives and overcoming poverty. For more information and to donate, visit www.caritas.org.au.